The Holy Ghost Association’s community gem. 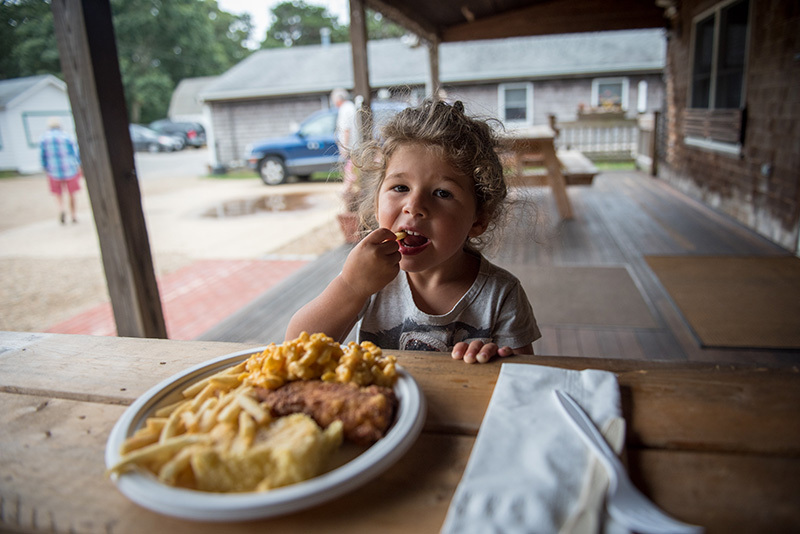 Community and generosity meet at the Holy Ghost Association Fish Fry at the Portuguese-American Club in Oak Bluffs. Folks from every corner of the Island pack tables, talking, laughing, and stuffing their faces. What’s on offer? Comfort food, P.A. 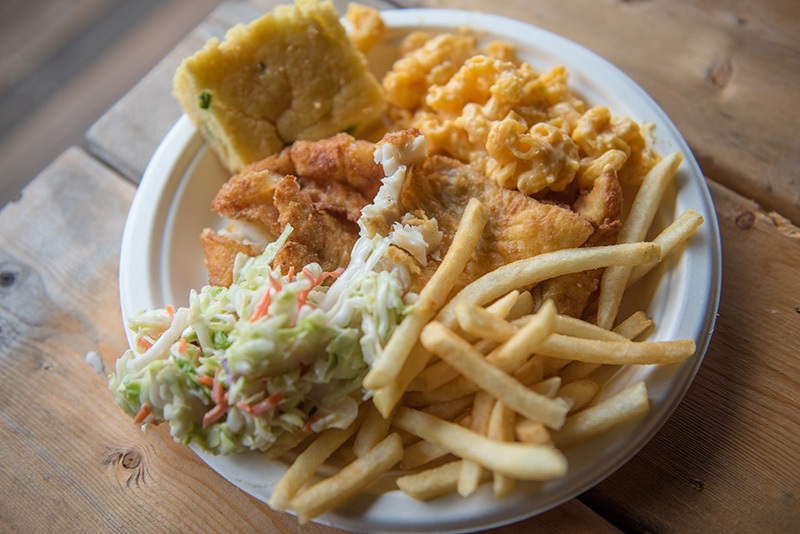 Club–style: paper plates mounded with fat fillets of fried cod wreathed in french fries, stacked cornbread squares, dollops of mac and cheese, and scoops of coleslaw. Service is buffet-style. The friendly servers will keep weighing down your plate until you give a hand signal … and it’s all you can eat. 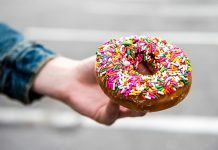 How many times you can return to the buffet is an equation involving the number of belt notches you have available, whether you have one or more hollow legs, whether you plan to hibernate soon, and whether you burned through a few calories earlier in the day swimming over from Woods Hole. I know what you’re wondering. Sure, sure adults love it, but will the food satisfy my kids? Well, to answer that question, your correspondent attended the fish fry recently with Times occasional food critic Electra L.M. Saltzberg, age 3. Electra immediately gravitated to the billiard balls in the P.A. Club bar. Thankfully, the balls she sent rolling over the green felt weren’t part of anybody’s game. After queing up for food, we took our plates outside to the picnic tables on the porch. Electra doublefisted fries and cornbread — a serious compliment. She then made short work of the mac and cheese. The fish was a tougher sell, but that was probably because her belly was already swollen like a black racer with a bullfrog in its gut. Unlike Electra, I went for the jalapeño cornbread — subtle kick, not a mouth searer. The fish was a delight, moist inside with a crisp batter. We’ve all had overfried cod, better used to shim a door jamb than to dip in tartar sauce, or soggy fried cod that looks like the base material for an arm cast, and cod fried in antique oil that exits the fryolator with the color of a rawhide handbag. 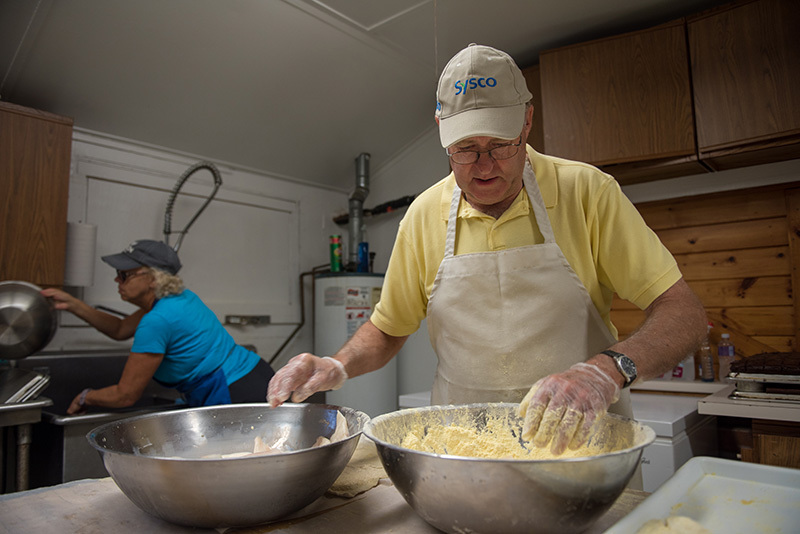 Despite the volume of fish they prepare, the Holy Ghost Association volunteers served up golden fillets fried that had absolutely none of those shortcomings. 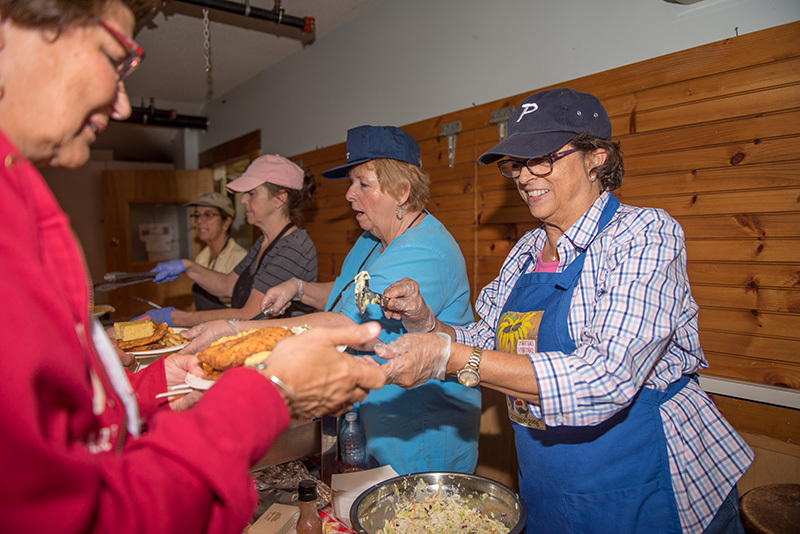 Trisha Bergeron, former president of the Holy Ghost Association and a member of the board of directors, manages the fish fry with Bertha Blake. 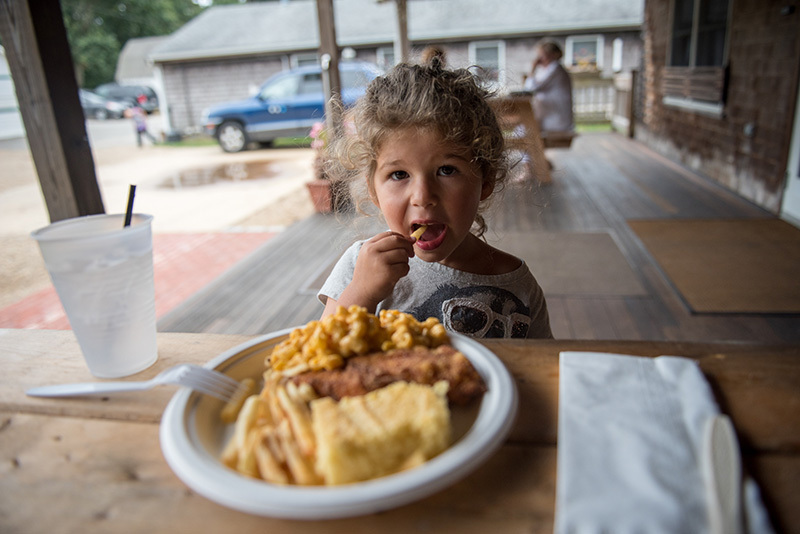 She said the fried cod is the handiwork of longtime fish fry fry cook Kayla Parkhurst. 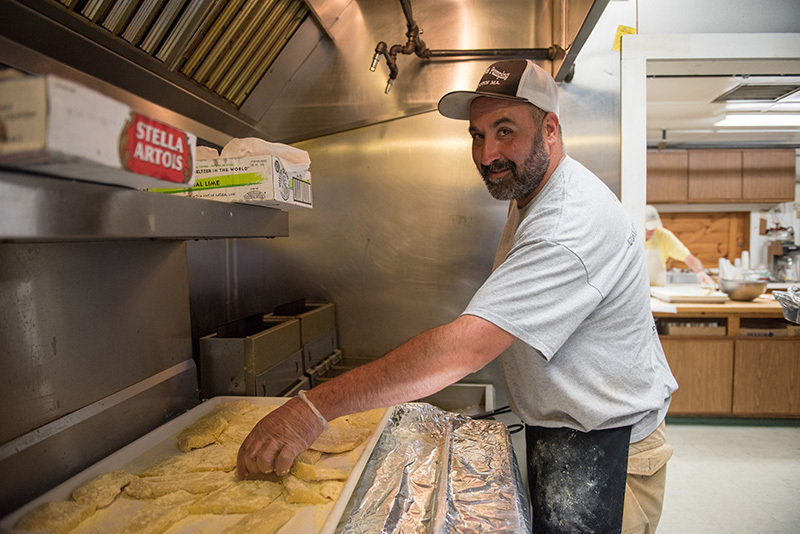 Parkhurst used to be the fry cook at old Lawry’s (where Sharky’s Edgartown is now), she said, and she works very hard during the fish fries. The fish fry this correspondent attended began at 5 pm. “We actually sold out at quarter of seven,” Bergeron said. 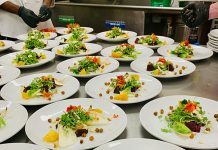 The evening grossed about $3,400, had about 225 dinners and used “probably 180 pounds of cod,” she said. 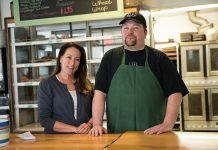 The funds keep the organization running and help to keep its prices low. In the summer, fish fries occur at the P.A. Club on a biweekly basis. 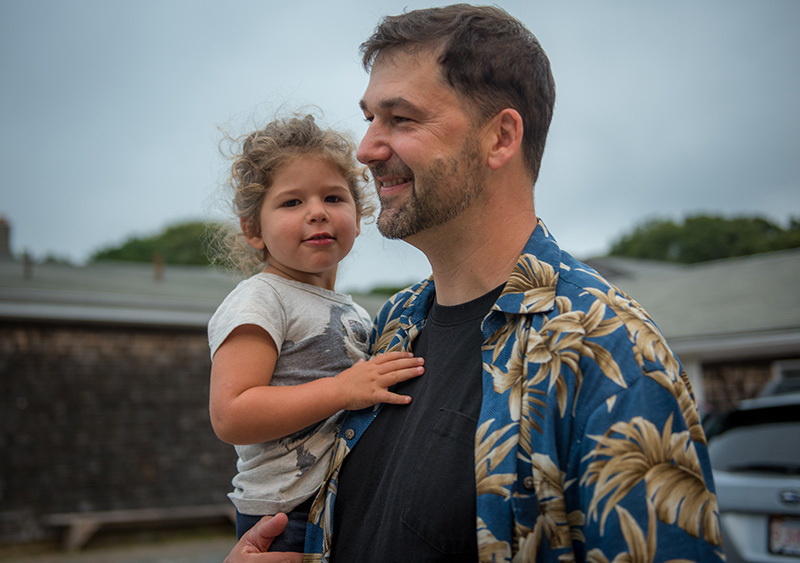 In the winter they are held monthly, “usually on the third Thursday of the month,” she said. 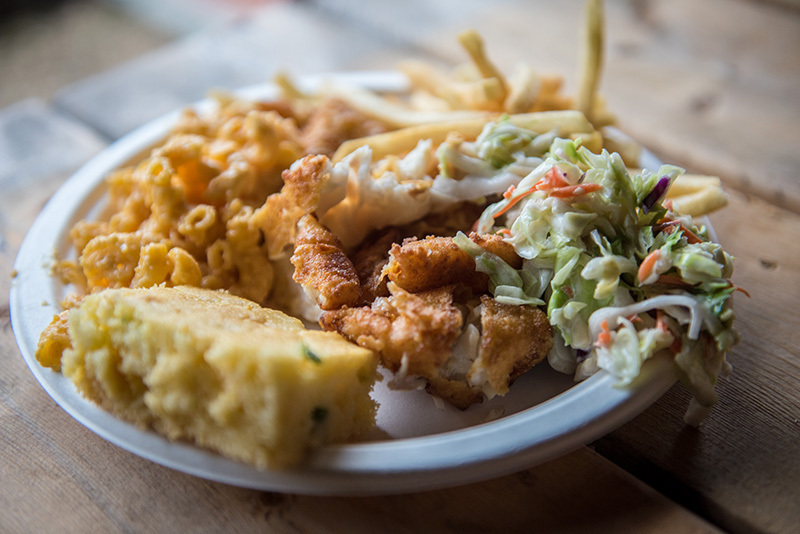 The next fish fry is slated for Sept. 27. Bergeron said on the third Sunday of the month, anyone is welcome to become a member. Membership to the Holy Ghost Association requires filling out a form, two sponsors, and a $125 fee. Thereafter dues are $75 annually.